Bishops Well Cottage is a lovingly and sympathetically restored farmhouse attached to the 17th century Manoir. It has been furnished and equipped to a high standard and provides an ideal location for a family holiday.The cottage has a comfortable lounge/dining room featuring a magnificent granite fireplace with log stove, a well equipped kitchen and shower room on the ground floor .The master bedroom is a large,beautiful sunlit room built into the roof to retain the king-post construction. It has a small mezzanine floor (useful for an extra mattress if required) and an ancient armoire- front amongst many features.The 2 other bedrooms are light and airy; the larger, equipped with two single beds, has a large lucarne window facing the front drive and garden whilst the other, with bunk beds, has a velux window overlooking the cherry orchard.Although attached to the main house, the cottage has its own completely separate and private entrance. Guests are invited to enjoy any part of the garden at their leisure, there being ample space to accommodate all tastes from peaceful reading and shady picnic spots to boisterous ball games..
A private barbecue and garden furniture; a grassed badminton/volleyball court; games room with pool table, table tennis, darts and table football; swings, slide and ball games are provided. 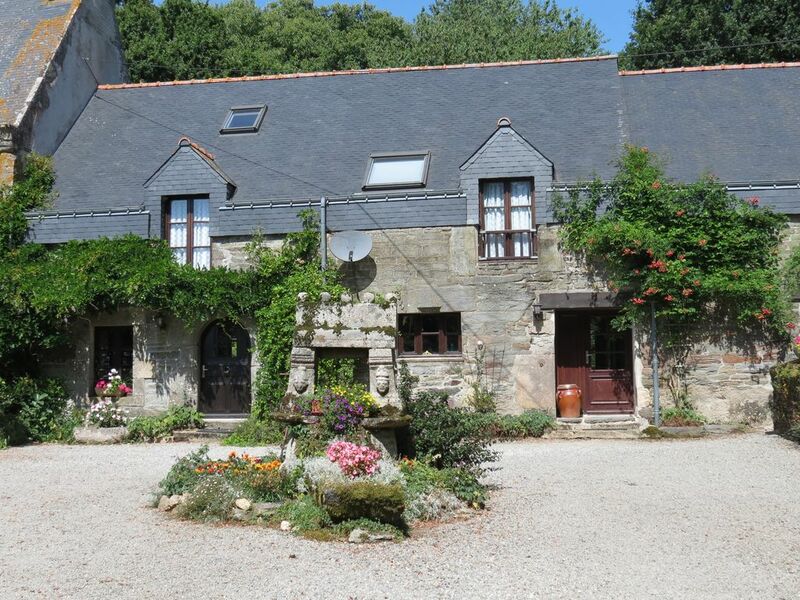 .For local amenities Bodion is approximately 15 mins from the historic town of Pontivy where you will find supermarkets, restaurants and shops. Plumeliau, a 5 minute drive, is our local village; a friendly place to buy bread and croissants . It has an excellant creperie/pizzeria, LA FORGE and a couple of friendly bars. St Nicholas des Eaux (15 mins), a charming village on the Blavet River, offers two restaurants, creperies and bars as well as river cruises and kayaking. There is also a an adventure park for all the family with go-carts and animals. The children will love tree climbing at the Adventure Forest near Camors and beaches are within 40 minutes drive. These, with the chateaux, museums, restaurants and a steady passage of pardons, fetes and fest noz, will, we think, ensure a varied and enjoyable holiday for all the family. The living room has 2 comfortable 3- seater sofas, a dining table and chairs TV and DVD player. Bishop's Well can be rented with The Coach House and Chained Heart for reunions, celebrations and family get-togethers for up to 22 people. Pontivy is a charming country town on the River Blavet with many beautiful half-timbered, corbelled and turreted houses, cobbled streets and attractive shops in the old quarter around the 16th century church of Notre Dame de la Joie.The 15th century Castle of the Dukes of Rohan with its two remaining towers is well-worth a visit. There is a good variety of restaurants, cafes, interesting shops and good supermarkets. Market day is Monday. There is Cycling for all stages from the gentle towpaths beside the Blavet river, through quiet country lanes and villages to the more exacting marked trails. Bicycles are available to hire locally. Fishing; all types of angling is catered for and daily or weekly permits are available. Golf. There is the 9-hole course at Bieuzy les Eaux and the 18 hole courses nearVannes , Lorient and Auray. Gokarting in Plumeliau , Auray and Lanester near Lorient. Tree climbing in the adventure forest at Camors is a lot of fun for the fit and energetic. Watersports include canoeing on rivers, water skiing on inland lakes at Guerledan and Priziac and sailing, surfing and windsurfing on the coast. Historic towns such as Pontivy, Auray Vannes Josselin and Quimper have retained much of their medieval character and are well worth a visit. Linen is included in the rental. Please bring your own pool towels Changeover day is Sunday. Flexible out of summer months There is a log fire and central heating for out of season holidays. Heating will be charged sperately An evening meal can be prepared for your arrival and during your stay. Groceries can be bought for your arrival Ask for details.